When looking for a reputable mobile auto repair service in Las Vegas, not only do you want to work with a highly trained and experienced technician, but one that values honesty, integrity, and professionalism. I am an ASE certified mechanic with more than 20 years of experience offering quality auto repair work and honest advice at fair prices. I am honored to be Las Vegas’s most reliable and professional mobile auto mechanic keeping vehicles well-maintained and reliable. I grew up around my dad working on automobiles in his personal garage, tinkering on engines. I’d say we really made a great team as true mechanics! Well, this is where my passion for cars and auto repair was rekindled. I learnt by doing and that’s how I got my original hands-on experience and lessons in auto repair. Cars are my passion and past time. My background around cars influenced my choice of becoming an ASE certified auto mechanic that I am today. I’d love to work with you to show you the value of having a friendly, reliably, and highly skilled auto repair mechanic come to you. I understand how valuable your truck, car, or van is to you which is why I bring you the convenience of not being inconvenienced by bringing the repair shop to you. My primary goal is to safely get you back on the road as soon as possible while saving you time and money. I have the professional expertise, experience, and right equipment to service and fix even the most challenging vehicle problems. I guarantee all of my auto repair work and ensure complete customer satisfaction. You’ll certainly be happy with the outcome. Call and give Las Vegas’s best mobile auto mechanic a try! 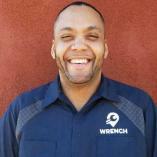 I just started working with a new scheduling service for mechanics called WRENCH. I hope it makes thing flow a lot easier. You can now do online diagnostics with our website online! Really cool stuff. Hope to get you on the road soon!